Leslie Korn, PhD, writes that real food is medicine, but fake food is toxic to the brain, and inadequate nutrition leads to poor mental health. She outlines the kinds of real foods, supplements, and lifestyle practices that nurture mental wellness. Stephen Sinatra, MD, asserts that learning to love yourself changes you for the better. It is when you truly love yourself that you can create the healthiest, most balanced relationships with everyone in your life. Leslie Shore, MA, points out that listening is an important communication skill, but we often allow ourselves to become distracted to the detriment of our relationships by phones, tablets, TVs and other electronic devices. Mary Heath discusses the novel idea that doing one thing at a time, from talking on the telephone to finishing a chore, can help you be far more efficient and inspired than trying to do many things at once. 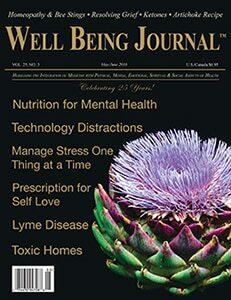 CJ Puotinen explores the foremost issues pertaining to Lyme Disease, from the challenge of obtaining an accurate diagnosis to the many conventional and integrative medical alternatives for treatment, including homeopathy and hyperthermia. Laura Ehlers, MHNE, cautions about the toxic chemicals often found in new carpets, drywall, kitchen and bathroom cabinets, and other parts of the home, and she offers nontoxic remedies. yourself and others, and allowing yourself to express grief can lead to greater physical and emotional well-being. Scott Miners tells a personal story of healing a bee sting through the use of both topical and homeopathic remedies.